As useful as ridiculous looking. 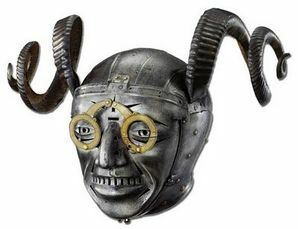 A strange helmet mostly worn by gentlemanly heroes. Built in to the helmet is an intimidating mask which is sure to baffle any opponent the hero may encounter, as this is where the main offensive properties of the helmet lie. To add to the confusion, fixed on the mask part is a golden glasses-like frame with removable lenses. The main feature however is obviously the artificially twisted rams horns (you didn't think rams horns really could get THAT twisty did you?). The whole helmet itself offers minimal protection but swaps defence for effect by fitting the head of the wearer very well. Some monsters have mistaken heroes wearing these helmets for other monsters and have been scared off. Other monsters that are similar in appearance to the helmet have done the opposite. Caution is therefore advised when using this most strangest of head gear.